With the likeness in their voices, you may be forgiven for mistaking Solange’s vocals for her older sister Beyoncé. But, she is a musical talent in her own right, with the genius and confidence to match her sister. Her take on Pop and RnB is experimental, drawing influences from all over the world and multiple eras, much like her approach to clothing. Solange is a fashion icon. Her striking look is stylish and fun, making her the envy of fashionistas everywhere. Her outfits are eye-catching; amalgamating masculine tailoring, bold colour, and clashing prints. 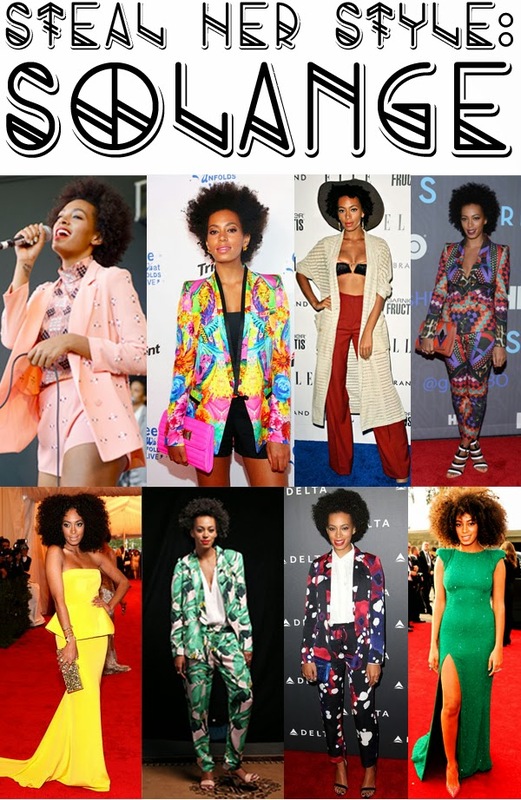 Solange’s wardrobe is one of my most coveted; I couldn’t help myself compiling a post about how to get her look! This first look is about incorporating clashing prints so that they don’t fight against each other. Here I’ve paired the smaller print of the red trousers with the large leopard print of the jacket, so that they complement. The white She Likes heels are a versitle addition to your warderobe, worn smart or casual. I have fallen in love with the bright and bold statement these leopard print trousers make. Granted they are a daring garment to wear, and you have to be confident in your conviction to wear them, but Solange’s look is all about making an impact. This outfit is more casual and comfy. The flowiness of the fabrics used in the Glamourous trousers and ASOS jacket, give it an elegant touch. I love how the colour continuity in the shoes and jacket brings the outfit together. I love the way bright yellow looks against Solange’s skin tone. This outfit is inspired by the Rachel Roy dress she wore at the Met Ball 2012. I couldn’t find a maxi dupe but I think this shorter version by AQ/AQ is much more wearable. I love the gold accessories, but gold is my favourite colour so I’m biased! The African/Aztec print on this matching set by Missguided is the perfect example of incorporating Solange’s love for print into your going-out look. I like how the Office shoes are from the same colour palette of monochrome and yellow, yet don’t detract from the top and shorts. The detail on the She Likes cover up keeps the look interesting from the back. This look is only for the brave! It’s a loud and proud tropical explosion. I’ve tried to translate Solange’s tailored siloette from her designer pieces, into more affordable pieces like this set from from River Island. Her look often includes a low neckline so this ASOS top is perfect. The neon pink bag is an extra shot of colour just in case the bold floral print wasn’t enough! Solange is a big fan of a shorts suit. The print on this Boohoo twin set is gorgeous and I like the detail in the multiple colours the pattern is made up of. Miista shoes are becoming a favourite of mine and theses brouges are to die for! If you aren’t a big fan of bright colours and loud prints, this outfit may be more up your street. I picked out some muted winter florals in these beautiful pieces from She Likes for a slightly more subtle look. The navy Missguided blazer is great for throwing on over so many outfits you’ll get plenty of wear out of it. What do you think of Solange's style? Do you have any favourites pieces? Leave me a comment below. Or enter your email in the box in the right side bar to get notifications to your email inbox. These picks really come from a girl with strong character and she is!! I love this type of posts... they are so fun!! Couldn't love this post more if I tried!